Some banks have different nuances or requirements before importing - here's what we know! Here's a list of known issues with certain banks you can reference, along with recommended workarounds or next steps. If your bank is not shown and your issue is not covered in the FAQs article, please Contact Us. If you have multiple card programs for your Amex US Business account, before you can import them to Expensify, you will need to contact Amex and have them separate the multiple card programs to separate logins. As an example, you would need to have your Business Platinum cards under “username1/password1”, and Business Gold cards under “username2/password2”. Please note that if you have multiple business card systems associated with one online banking username, and these cards are already connected to Expensify, your connection will no longer function. You will not be able to resolve the connection and/or connect new American Express Business cards until you contact American Express to request that completely unique/separate online banking credentials be issued for each individual card system. We are currently experiencing issues connecting to American Express cards issued in Australia or the UK. Please do not attempt to use the US-based connection, as this is not supported and it will not work reliably. In the meantime, you'll want to use our spreadsheet import method. Barclaycard recently implemented a mandatory SecurPass code for their accounts, which effectively disallows access to their system for third parties like Expensify. There's not much, if anything, we can do to bypass that, so if you would like to contact Barclay and ask them to disable that on your account, that would allow you to connect it to Expensify. If you're not able to turn off SecurPass, you'll want to use our spreadsheet import method. If you have not yet upgraded to our new Capital One connection (we likely sent you a message about this in April 2017), your card will most likely no longer import expenses automatically. You will want to update your connection by re-adding your card here, or by navigating to Settings > Your Account > Credit Card Import > Import Card/Transactions and choosing Capital One (New and Upgraded). If you are looking to update company cards, head to Settings > Domain Control > [Your domain] > Company Cards. You will need to add it as a new card using the new connection in order for transactions to be imported moving forward; the older connection is no longer supported. Once successfully synced, please delete your old Capital One connection to avoid importing duplicate expenses. Be sure that all of your expenses from the old connection have been submitted before removing the old card connection. 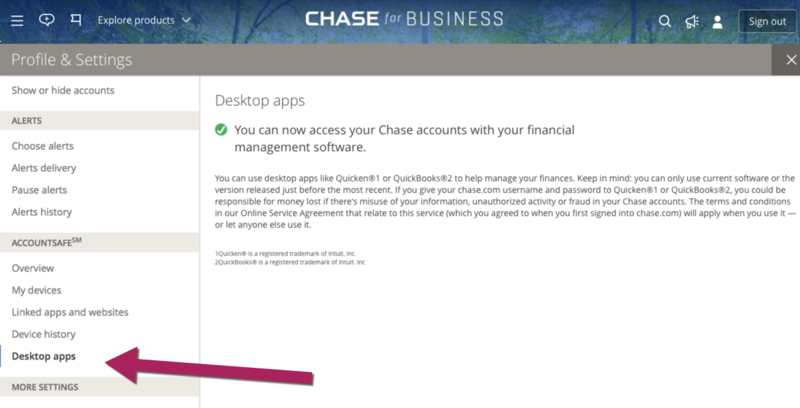 Chase requires that you enable Direct Connect on their end with the Owner's credentials before connecting to financial management software like Expensify. Please note: as of mid-2018, you must also have a Business Checking account with Chase to enabled Direct Connect and/or for it to work. After you've set this up from your Chase account, you can start importing the credit card transactions to Expensify. If you are not sure that you have it enabled in your Chase account, consider contacting Chase customer service to double-check. Pro-tip: In the past Chase customer service has confused Direct Connect with relation to Expensify. If you are having trouble enabling Direct Connect for Chase, you may have better luck contacting Chase directly and asking them to "Activate Quicken." Citi is transitioning CitiBusiness accounts to a new online banking platform, as well as, in some cases, migrating types of cards. These major changes have resulted in the CitiBusiness connection breaking for most of our customers. Because we must (in a best case scenario) wait for these changes to be resolved, we cannot provide an ETA on when the connections will be fixed. We recommend seeking out a direct commercial feed from Citi where possible; you will want to contact Citi about this (you will likely be required to be on a commercial tier of service with them, as opposed to something like small business). Otherwise, your best bet will be to use the our spreadsheet import method in the meantime. We're no longer able to connect to Navy Federal's system to import expenses due to an IP block from their side. Your best bet will be to use the our spreadsheet import method in the meantime. Like some other banks, PNC requires Direct Connect in order to connect to third party services such as Expensify. You will want to contact PNC to request this is activated (simply ask for Direct Connect; do not mention Expensify as this will likely cause them to tell you they don't support Expensfy--an FAQ above). They will snail-mail you a PIN to use to connect. Please note that this only applies to personal cards. If your PNC cards are corporate cards, you will need to contact your bank relationship manager to see if your card program is eligible for a commercial card feed. Like some other banks, SVB requires Direct Connect in order to connect to third party services such as Expensify. You will want to contact SVB to request this is activated (simply ask for Direct Connect; do not mention Expensify as this will likely cause them to tell you they don't support Expensfy--an FAQ above). They will provide you a PIN to use to connect in place of your online banking password. You will notice that there are two SVB options to choose in Expensify: SVBConnect.com and SVB Direct Connect. Both options can be used to connect your card, and they are listed there to provide an alternative in case you are having issues using one or the other. If you're connecting to SVB via Settings > Domain Control > [Domain Name] > Company Cards, you'll want to contact SVB to get setup with a CDF feed. Check our doc here for help with this. When logging in using USAA, be sure to user your member number and pin in place of the user id and password fields, respectively. Wells Fargo requires Direct Connect to be enabled similar to Chase, SVB, and PNC, but Wells Fargo usually has this on by default. If you are having trouble connecting, however, this would be a first step to check with them. Recently, Wells Fargo made a change which resulted in many customers disconnecting and who simply needed to reduce their password to less than 14 characters to reconnect. If you're experiencing issues with a current Wells Fargo connection, try changing your password and make sure the new password is less than 14 characters long (even if this is already the case, change it anyway). Then attempt to connect your card again. Want to hear first-hand about the current status of our site/connections? Please visit the Expensify Status page and subscribe for updates here. First, please read the FAQ article and Known Issues (above) to make sure the issue is not covered there first. A way to identify which card is affected (e.g., the last 4 digits of the card), the name of the bank that issues the card, what type of card it is (Visa, MasterCard, American Express), etc - essentially anything that is pertinent to the issue at hand. This will help us resolve your issue more quickly! PLEASE DO NOT SEND US SENSITIVE BANKING INFORMATION! These include, but are not limited to credit card numbers, online banking passwords, and CVV codes. While Expensify will never do anything malicious with this information, and we will scrub it from our systems when it happens, we cannot guarantee the security of the networks over which it will have been sent to get to us. If you have accidentally done so, we always recommend contacting your bank to let them know this information was transmitted over the internet so they can help recommend the next best steps.